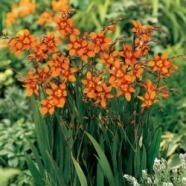 This striking perennial has vibrant orange flowers with a splashes of crimson on each petal they erupt on slender stems from slender green foliage during late summer. Plant care. Plant 10cm deep and 10cm apart into well drained soil. Leave the foliage to die down naturally. These long lasting flowers provide massive impact for any mixed border or cottage garden scheme they grow well at the coast and the long stems make an excellent cut flower for summer bouquets.